If you’re building mobile apps or games with Delphi XE7 Firemonkey you may be looking for an easy way to add sound effects. There is an application called sfxr that was originally created by Tomas Pettersson in C++ which can help. 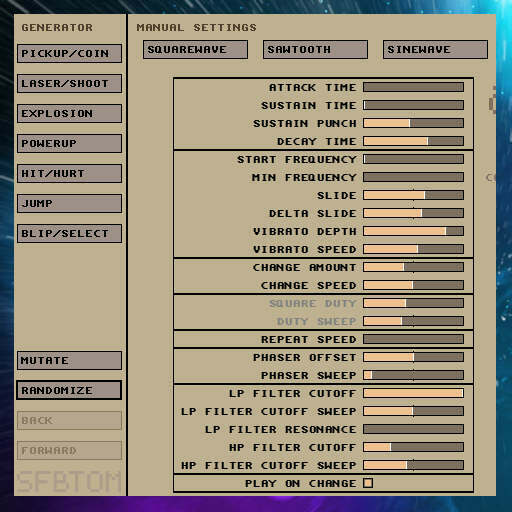 Basically it is a sound effect generator with some built in sound effect categories which are pickup/coin, laser/shoot, explosion, powerup, hit/hurt, jump, and blip/select. The sound effects are procedurally generated and sound like classic 8-bit arcade sounds. The original souce code has be upgraded and modified by a couple different people and the app is available as a Flash app in the web browser for easy sound generation. You can press the button for the type of sound that you want like Powerup and it will randomly change the settings to generate a powerup style sound. Each time you hit the button you get a new sound. From there you can mutate the sound or manually change the settings to get it more to your liking. The sounds are savable as WAV files and have a pretty small size. You can use the resulting sounds for button clicks or game sound effects in your Delphi XE7 & Appmethod Firemonkey apps on Android, IOS, OSX, and Windows. You can play sound effects in your apps using this free TGameAudioManager class. Head over and start creating your sound effects for Delphi XE7 Firemonkey with the Flash version of Sfxr or try this second Flash version called Bfxr which has an expanded set of features.